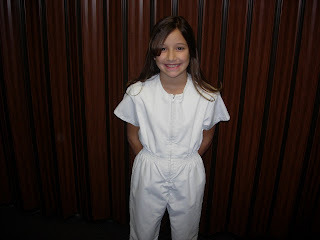 It was Sydney's baptism day. What a beautiful day! She was a little bit nervous, but mostly excited. 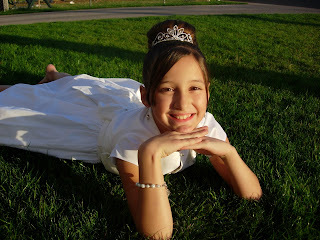 She looked so pretty in her white dress, just like a little princess. Paij lead the music, and did so great! I was feeling really good, I felt in control of my emotions, well until my father in law got up to do his talk on the Holy Ghost. He proceeded to invite Rich and I up, and my parents, Rich's mom, Grandma Hamblin, and Gay and Boppa. We were all a little confused at to what he was doing, but he explained to Sydney that all of the people standing in front of her had testimonies of the gospel and all of us have had experiences in which we had been prompted by the Holy Ghost. He said that Boppa would be representing all of us in bearing his testimony. I lost it. Well, at least I wasn't the only one. I'm not sure if there was a dry eye in the room. I was so touched and felt the Spirit so strong. I am so happy that Sydney, and all of my children experienced that today! We are so luck to have all 3 of my grandparents and all of their wisdom and experience to influence our lives. Thanks to Rich's dad for that inspiration! We had a great luncheon after at our house, yummy food, great family and friends! 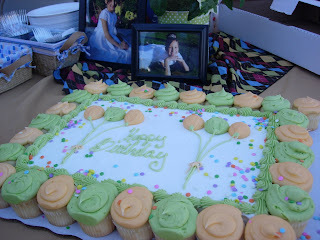 Thanks to everyone for making this such a special day! 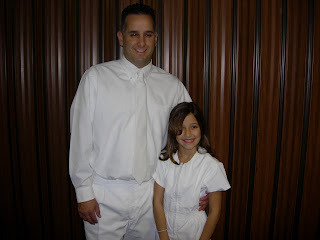 I had no idea she was getting baptised!!! That is so wonderful!!! Congrats!! it was a beautiful batism and a wonderful morning. you have an awesome famliy - thx for inviting us to enjoy it with you! I am way excited for you Syndey. It sounds like it was a really awesome baptism and a very special day for everyone. I love those moments that remind us of why we are really here! And the campout looks like a blast. I really couldn't hear your Boppa's testimony all that well, but I sure felt it! Curt and I really would like to thank you for inviting us and making a part of the day.